Axis 70U Network Document Server. With the AXIS 70U Network Document Server you can scan documents, reports and photos, and e-mail them instantly to any number of recipients simultaneously. 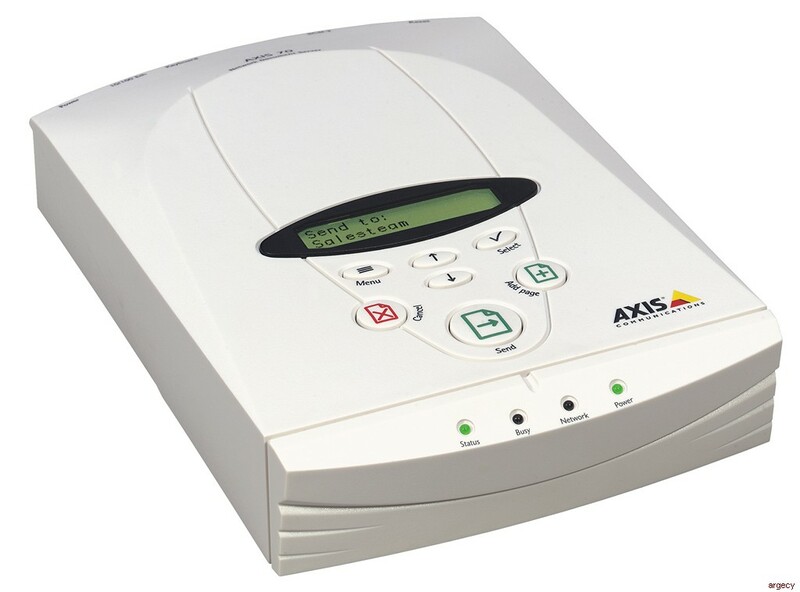 Easy to install and use, AXIS 70U provides a faster, cheaper and safer method of distributing documents than by fax, traditional mail or courier. * Connects popular office scanners such as HP, Epson and Fujitsu to IP Networks. * Distributes documents as E-mail attachments in standard Adobe PDF formats; includes Cc and Bcc functionalities. PackBits (4 bit) or JPEG (24 bit) formats. Alphanumeric LCD display with 2 rows of 16 characters. English, French, German, Italian, Spanish, Danish, Norwegian and Swedish text available. 4 multi-color LEDs signaling Status, Busy, Network and Power. 7 keys for Menu, Up, Down, Select, Send, Add page and Cancel. Menu functionality for selecting Destination, Profile, Paper Size and Double-sided. Optional: PC keyboard for easy search, ad-hoc entering of e-mail addresses and shortcuts to menu options. US, UK, German, Danish, Finish, Norwegian,Spanish, French and Swedish keyboard layouts. Windows NT/2000 and LDAP User authentication available. INSTALLATION- Set IP-address via user interface or optional keyboard or via DHCP, BOOTP, RARP or ARP. Configure destinations via Web browser or configuration file. E-mail addresses can also be automatically retrieved from the mail server via LDAP. DEVICES - Supports Scanners from: Epson, Fujitsu, HP and others. PROTOCOLS - Supports HTTP, IP, FTP, SMTP, TCP, LPD, Raw TCP/IP, ARP,RARP, BOOTP, DHCP, ICMP, SNMP, UDP, LDAP, NTP, WINS, SMB. MAIL SERVERS- Supports Microsoft Exchange, Sendmail, Lotus Notes, Novell Groupwise, Compatible SMTP mail servers. PROFILES - Text PDF low, Text PDF high, Color PDF high, Color PDF low. Ability to add/edit these profiles to suit specific needs. Configuration and administration via a standard Web browser. RJ-45 connector (Category 5 shielded twisted pair cable) for 10baseT Ethernet or 100 base TX Fast Ethernet. SECURITY - Administrators log-in for configuration and administration. Administrator specifies which destinations are accessible. Possible to set a default destination or single destination for fixed application use. Optional Windows NT/2000 or LDAP user authentication if keyboard is installed. E-mail delivery confirmation via MDN or DSN. Fast Ethernet: NWay support for autodetection of network speed. Use of IEEE802.2, IEEE802.3, SNAP and Ethernet II frame types simultaneously, full duplex. Flash memory allows central and remote software updates over the network using FTP over TCP/IP. SIZE - 5.9"w x 1.7"h x 8.8"d WT.- 1.5 lbs.